Our latest edition of the Gazette is now available. You can view it below and download and print it here. Though it may happen that a mother should be so hardened as to forget her own child, yet God promises He will never forget us. Think of the crosses with which Jesus has laden you, for they are treasures which He has drawn from the depths of His riches and you must look upon them as wonderful proofs of His love. THE Church has had two principal reasons in instituting the holy time of Lent: to make us . . . fulfil the duty of penance, and to make us meditate on the sufferings of Christ. law is binding on us as men; since we are heirs to the sin of Adam, we are also heirs to the sentence which has condemned him to suffer. 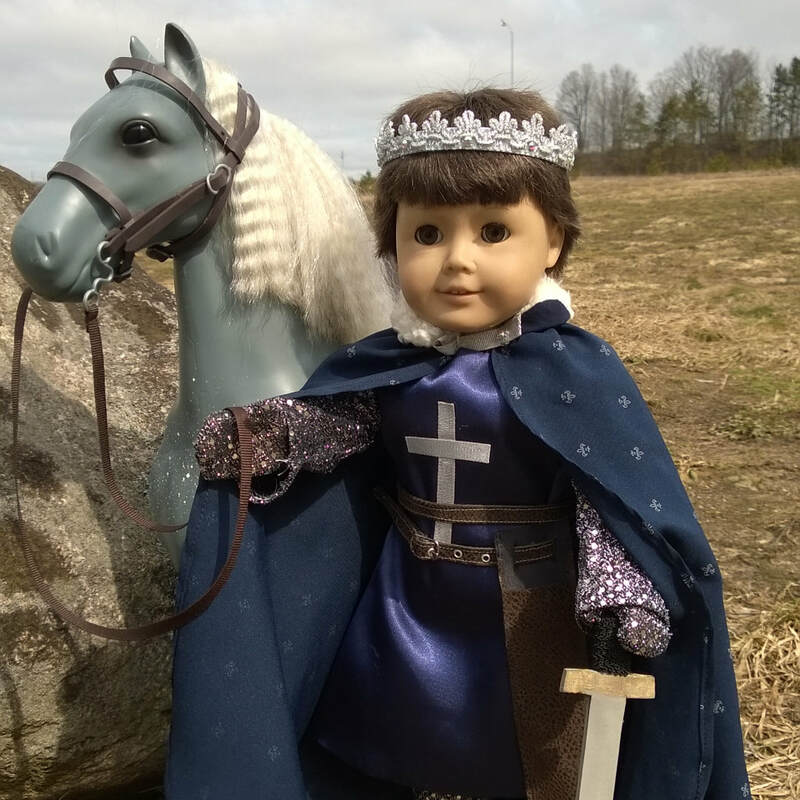 cross, fruits conceived amidst the heart rendings and agonies of Calvary; disciples of a God dead on the cross; sons of the King—but of a King crowned by sorrow; born to the purple—but the purple of His blood,—our life should not belie our origin! The sacrifice of the Saviour has been complete in all that regards the person and the merits of the Victim; but this sacrifice should continue in His members, who with Him form but one and the same mystical body. His cross remains forever planted in the midst of His Church, to recall to us the obligation of attaching ourselves to it and of dying on it with Him; and there shall be something wanting to His passion, as St. Paul has understood it, if it is not accomplished, also, in our own body; if the blood of Jesus does not continue, in some way, to flow in the veins of His apostles and martyrs and confessors, and in all those who believe in Him, until the time when the whole Church shall have passed from the state of suffering and of combat to the possession of glory. the Son" or to expiate your countless prevarications,—do you do it? 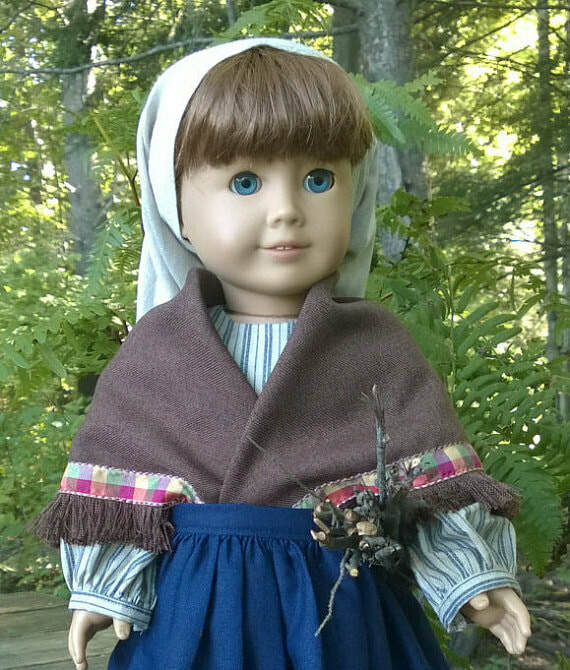 Alas!—you must admit it—your time is always ready, as the Saviour reproached the Jews: I mean the time for your business, your pleasures, the time for sin; but the time of Jesus, the time of penance, is never ready or at hand. You put it off, and defer it, and expect every day that the time shall come; but the time never comes. Now, the Church comes to assist us in our weakness and in our cowardice. 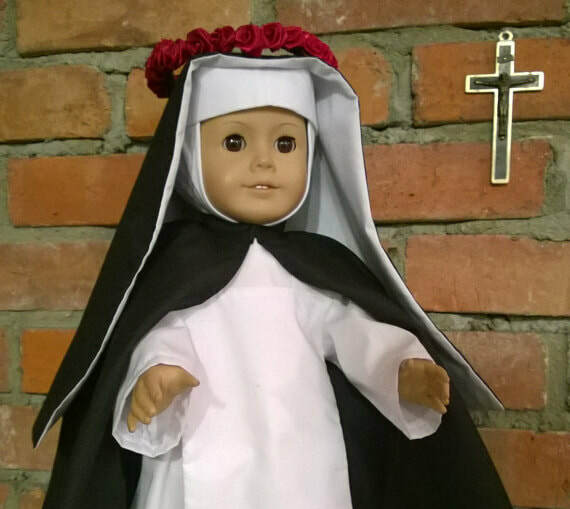 She strongly reminds you of this precept of penance, which your indifference neglects. From all the pulpits which are erected in the innumerable churches of the Catholic world the resounding voice is heard in unmistakable terms: "Unless you do penance you shall perish"
And, not content with reminding you of this great precept, the Church anticipates your indecision by determining the time when this duty will bind with greater rigor, and by indicating the most suitable manner of penance; thus, by a happy violence, she forces you, so to speak, to enter the way of penance by adding to the authority of God her own authority. 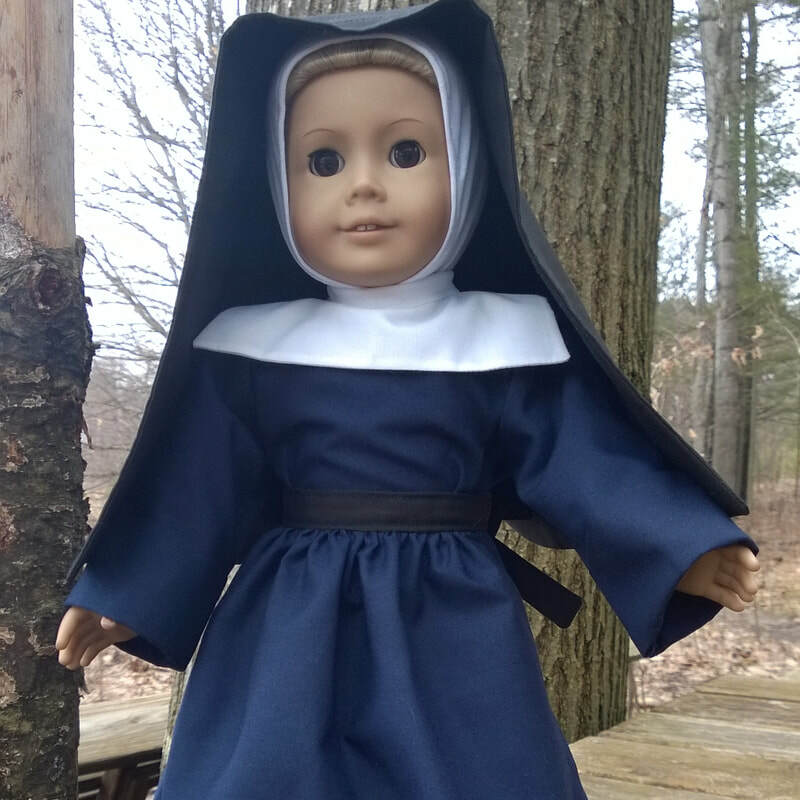 In fine, that you may not escape the pursuit of Divine Justice, she, in a way, encloses you in a circle of forty days, and she will not allow you to depart until you shall have given these sacred duties a just satisfaction. Do you love your soul enough to understand and second the merciful intentions of the Church in your regard? Second Point. 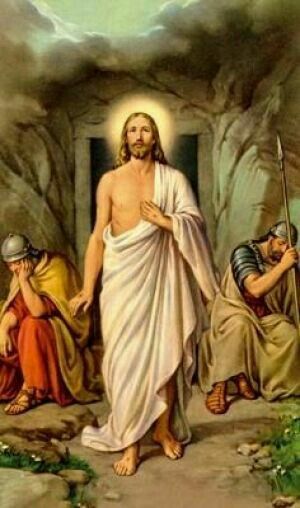 —By instituting the Lenten time the Church wishes to make us meditate on the sufferings of Our Saviour. 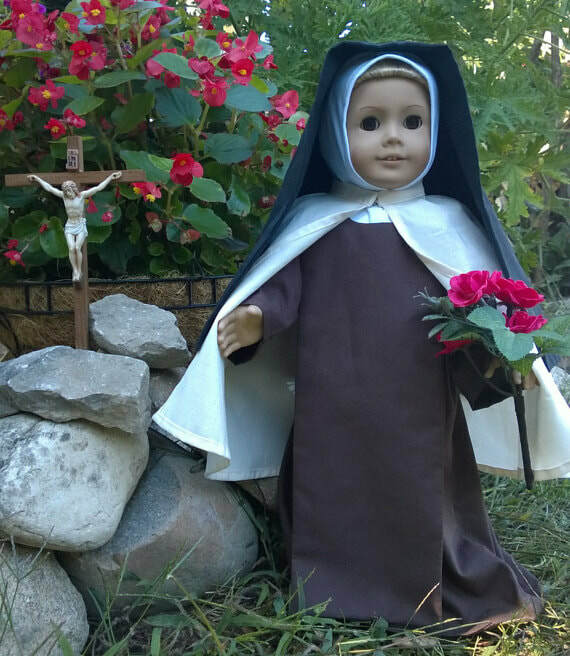 The mortification of the senses is not sufficient for salvation—it must be accompanied by compunction of heart. Now, what is more capable of exciting compunction in us than the meditation of a mystery as tender as it is terrible—-the mystery of our redemption? 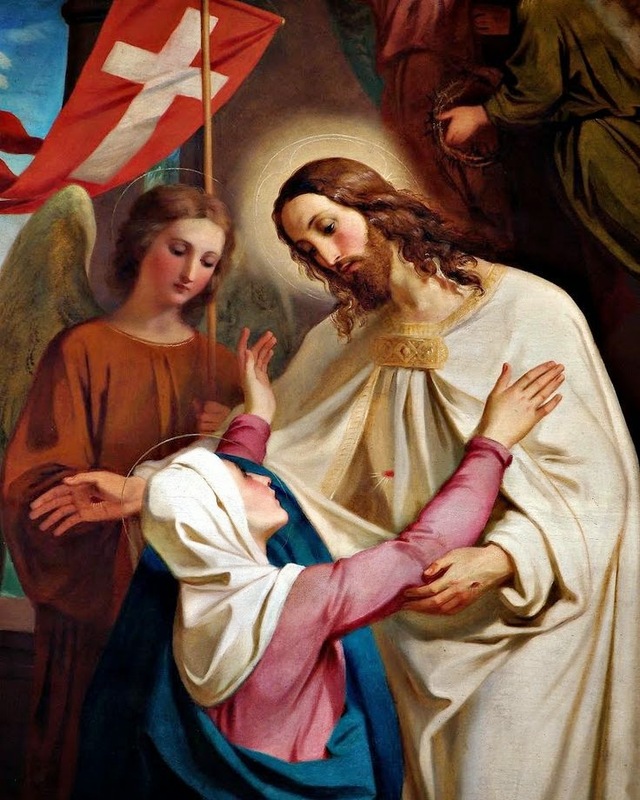 Unquestionably we can obtain this compunction of heart by other considerations, drawn from the grandeur of God, or His justice, or the heinousness of sin ; but the true source of tears—tears which flow from the heart as well as from the eyes; those tears which are sweet in their bitterness; which have the power to purify the soul, to strengthen it, to transform it, to create in it the new man,—the true source of such tears is in the cross; in the cross which illumines all the divine perfections, but in a manner so well arranged that His goodness dominates and absorbs all the other perfections, and all the rays of this grand glory melt away and are effaced in the single ray of love. The cross is by excellence the Christian's book. Every one may read it. There, in characters visible to every eye and accessible to every intelligence, you may learn what is most important for every Christian to know. Behold why the Church unfolds its blood-stained pages during the holy exercises of Lent! Not only does she wish that we should recall the grand mystery of our redemption, but she also renders it in a way present and sensible by the vivacity and truth of her pictures, as an action which had passed under our very eyes. 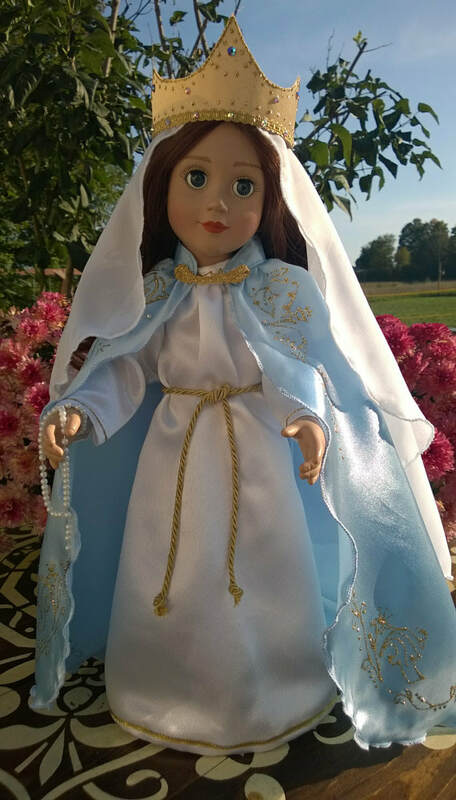 She sprinkles her children with ashes, she exchanges her vestments of joy which were worn on festival occasions, and assumes others of a sombre hue; she sings, it is true, but her chants are from a voice broken with sobs and tears ; she seems to fear the solitude, for her children are in such great sorrow; She invites them frequently to assemble in community for prayer, for the sacrifice of the Mass, and for pious reunions. We could say of her children that they are like a family bowed by sorrow, whose members have united to "weep for the loss of an only and well-beloved son." As the end approaches, the representation becomes more striking, and the impression of the death of the Man-God is more vividly felt. The very silence of His tomb seems to reign in the temple during the last days of the great and Holy Week. The stripped altars and the open and empty tabernacles leave nothing to behold except the cross unveiled—the cross which the Church only adores and only salutes in plaintive chants as our one, last, and only hope. Allow your heart to go out to, and be touched by, these holy impressions if you wish to respond to the intentions of the Church. Let your faith lead you to assist at each of these terrible scenes of which the drama of redemption is composed; gather with love the drops of bloody sweat falling from Jesus in the Garden of Olives; place your lips on each imprint of that precious blood which has reddened the road to Calvary; also to each of those sacred wounds from which spring the running waters of life eternal. Accompany by your sighs and tears, and with the daughters of Jerusalem, this new Isaac up to the hill-top of Calvary, and do not descend from the holy mountain where the greatest of sacrifices has been accomplished until you have struck your breast with the centurion; or, rather, do not quit the holy mountain, but remain there, crucified with Jesus; nail to the cross, not your feet and hands, but your sins and defects and desires, for which the Saviour has died; it shall be in vain that He died for your sins if you also do not die to them, to arise with Him to a new life. Be assured that you have entered into God's service only to be chiseled, polished and perfected each day by the hands of those with whom you live. 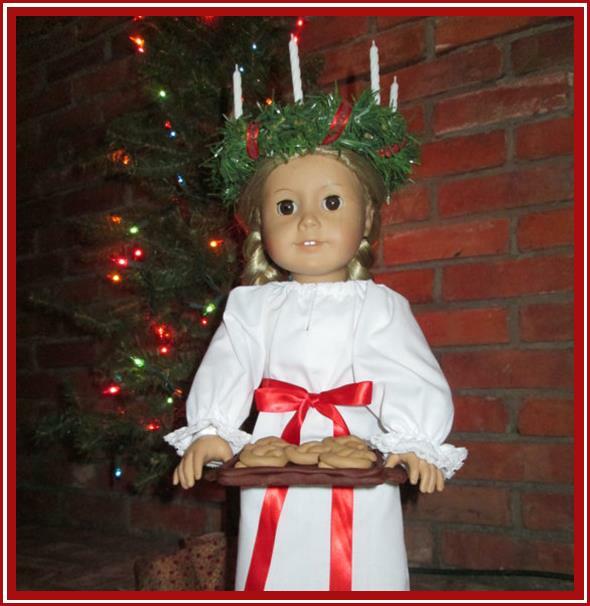 Look upon them as so many individuals sent to you by God to sanctify you by training you, each one in his own way. Let this dear Jesus be your nearest and dearest friend. Confide your trials to Him. Take everything as coming from His fatherly hand. Each suffering is a new flower added to the crown which is prepared for us in eternity. Trust and you will learn. Learn and you will love. Trust! with the conflict will come the courage. With the difficulty will come the help. With the trial will come the strength. With the temptation will come the grace. 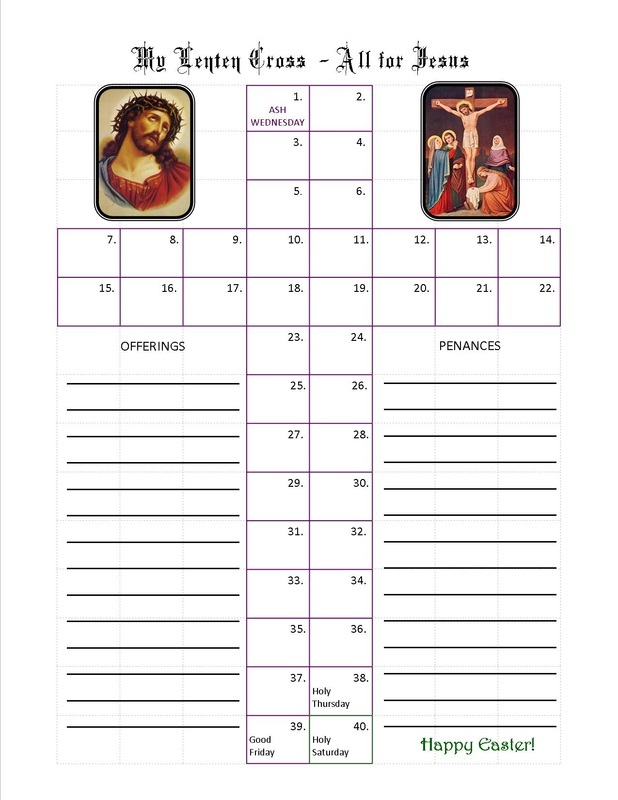 We would like to share a couple of printables that we use each Lent to help us keep on track. 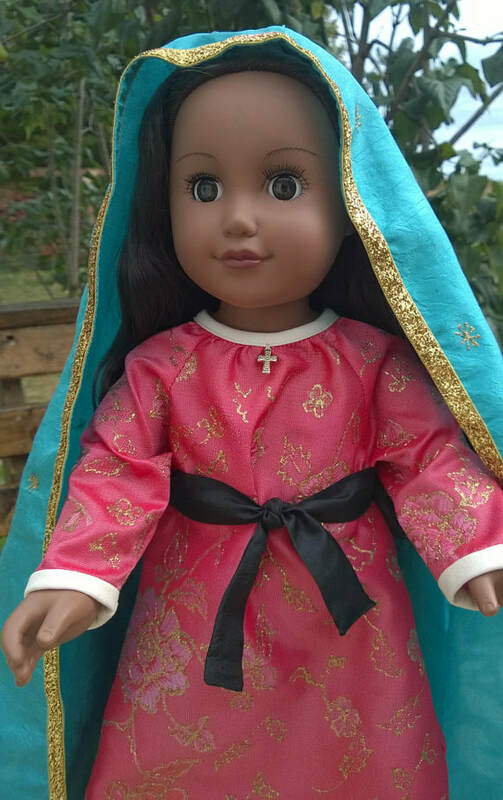 The child can either mark off each day as it passes or place one of the Sacred Heart stickers on their cross in the appropriate spot. May you all have a blessed and fruitful Lent. 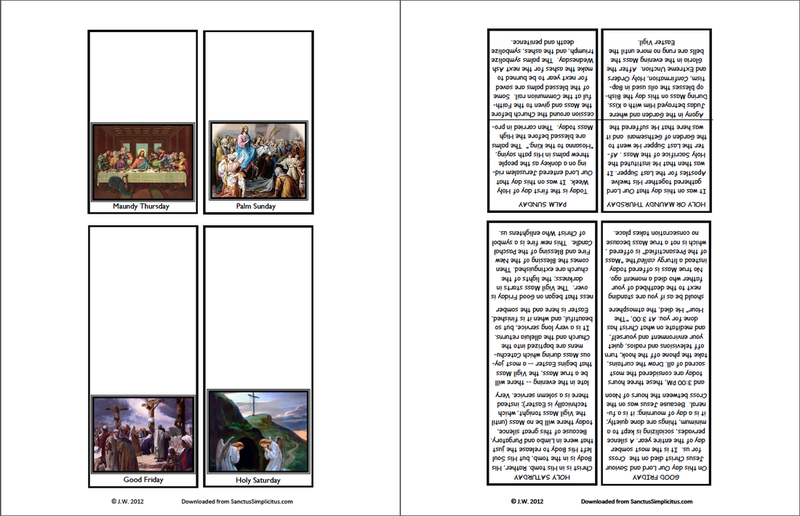 Sharing our Lenten Lapbook again for those who have asked for it. 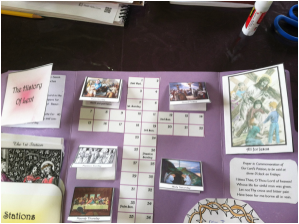 As we prepare for Lent, which starts on Ash Wednesday we thought we would share a tutorial on piecing together our Lenten Lapbook. At the bottom of this post are the files for the lapbook. Just below is a tutorial on making a single copy of the lapbook. Thank you to my dear friend CeAnne for making this tutorial for us its beyond my ability. 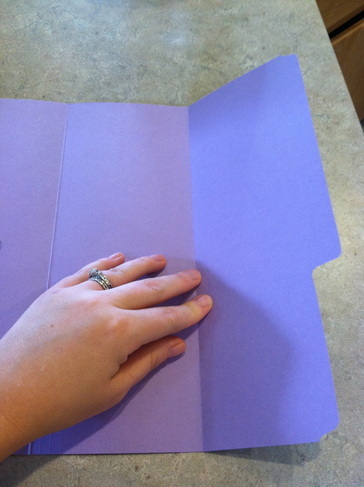 Again if all that is had is card stock or plain paper, use scissors and glue to accommodate. 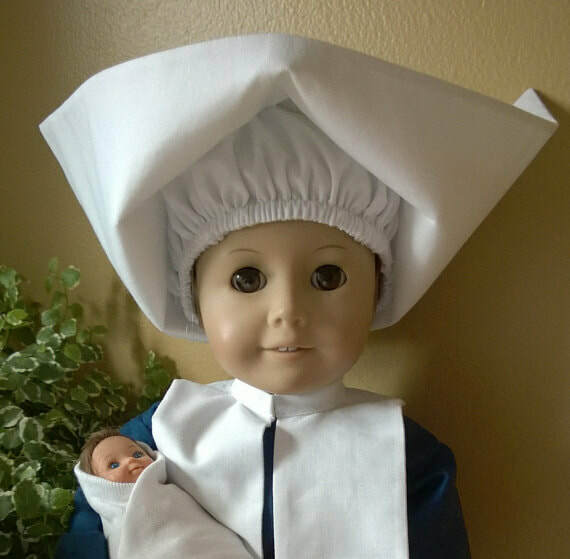 -Willing hands and a Lenten spirit! Please note: When printing, check your printer settings. All printers are different, but on mine the default is not set to a specific printer. In my print screen, I have to open the page setup, select my printer. If I print without doing this the size of the image on the paper is not right. Its very important when printing on the address labels that this is done right. 1.) 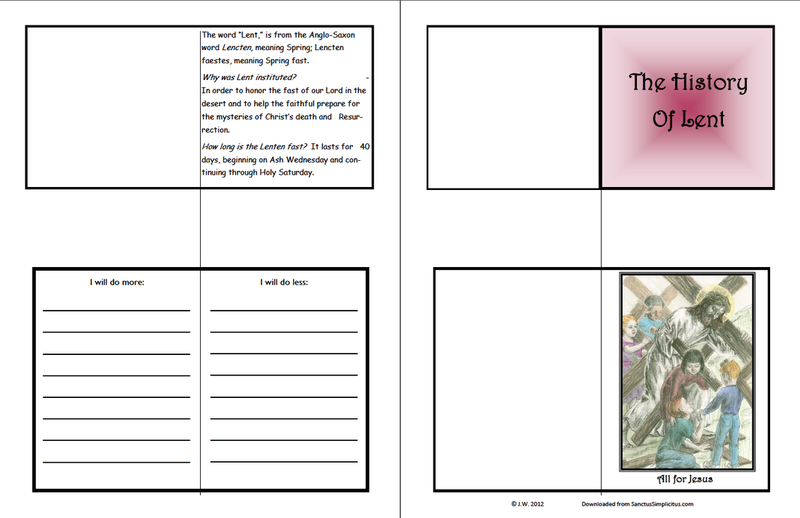 Print one of the two Lenten Lapbook covers, for EACH of the Lapbooks you plan on making. Carefuly and slowly color the picture of Our Lord that you chose. Cut out along the edges of the image. 2.) 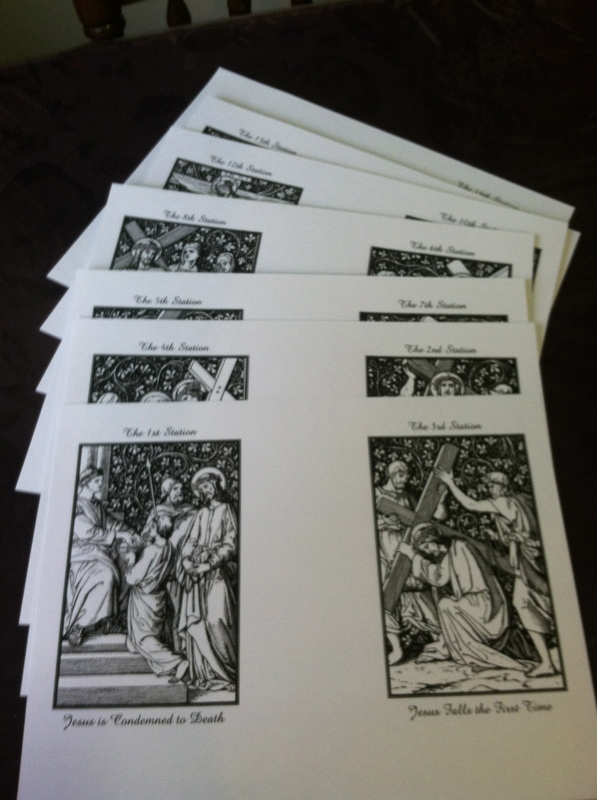 Print the History of Lent and All for Jesus Booklets, in color, double sided. Cut along the outside edge of both books, DO NOT CUT DOWN THE MIDDLE (insert mother voice here to children… may need to be repeated, or maybe tri-peated? ;) ) Fold down the middle of each booklet. Either at this point or once your lapbook is put together, read with your child the History of Lent. Then fill out the All for Jesus Book with things that your child plans on doing more of and things that your child will plan on doing less of during Lent. Set aside these books as we will put the lapbook together once all the elements are ready to go. 3.) 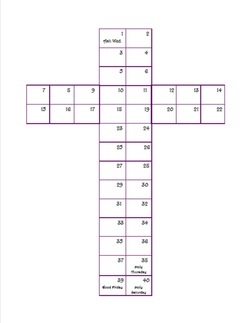 Print one copy, per lapbook you are making, of the Lenten Countdown Cross. Print in Color, single sided on card stock (if you are using card stock). Cut on the outside edge of the cross. DO NOT (in mother voice again) cut the lines inside the cross. Set aside for later. 4.) 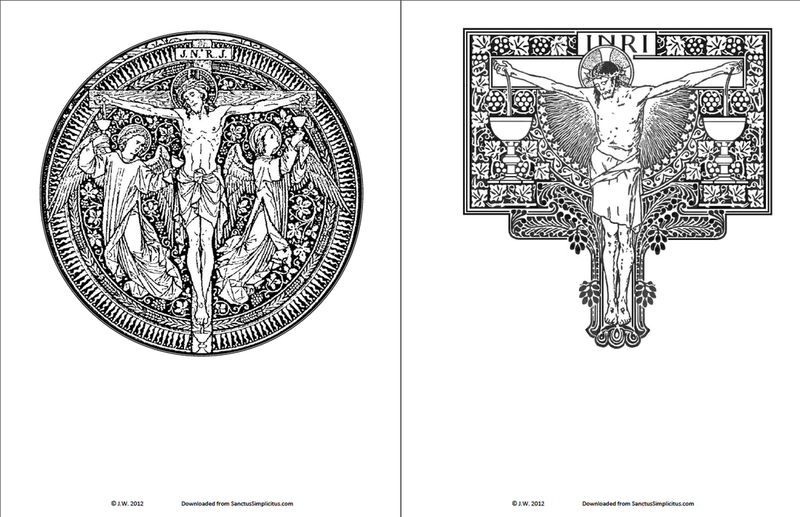 Print the Holy Week Matchbox Booklets AND the Passion Sunday File (with other pieces), 2 sided, in color. Cut each piece out around the outside bounding box. Set aside for later. 5.) 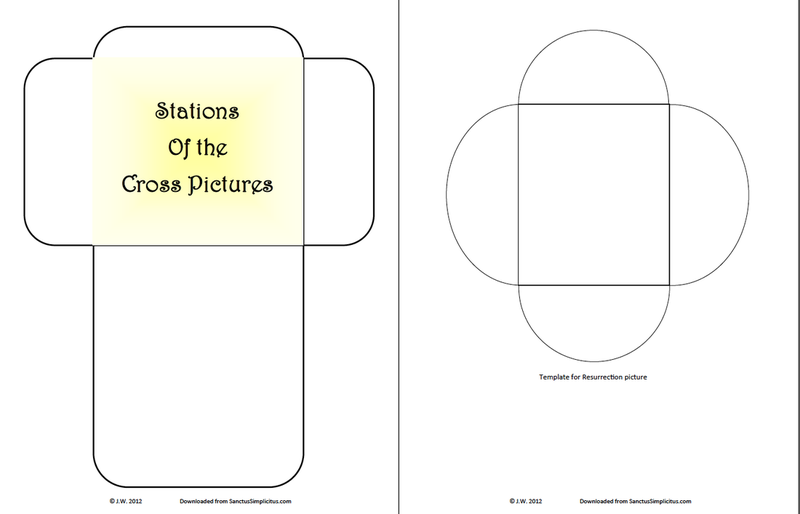 Print out the Stations Pocket and Resurrection flap book. Single sided, in color. Cut along the outside edges, do not cut the lines inside the book. If you want color the outside flaps of the Resurrection Flip book yellow and write He has Risen! On one flap. 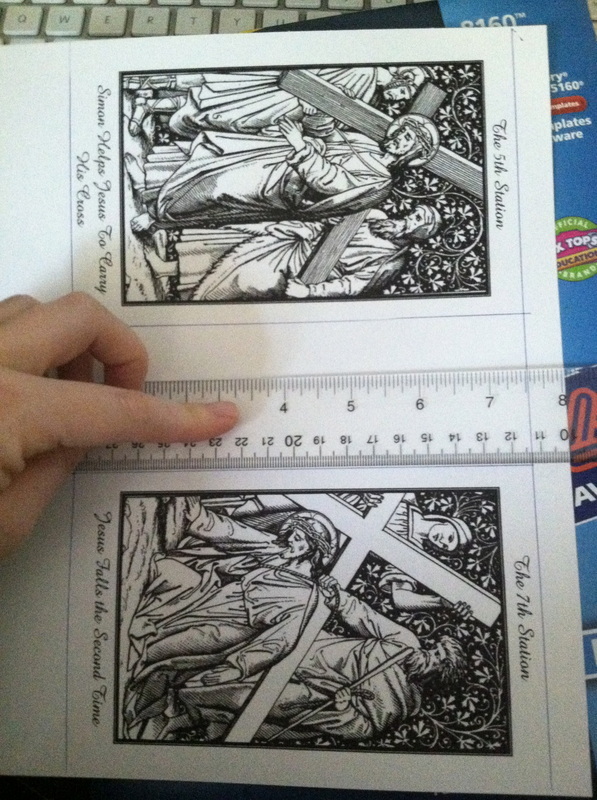 Using the picture of the Resurrection (printed in the step above), glue it to the inside square of the flap book. Fold the sides in starting with the top flap, then counter clock-wise. The last flap gets tucked under the first to hold it closed. For th e Stations pocket, fold the large flap back on the line then fold in the side flaps. Glue the back of the side flaps to the back flap to make a pocket.5.) Print out the Stations Pocket and Resurrection flap book. Single sided, in color. Cut along the outside edges, do not cut the lines inside the book. 7.) 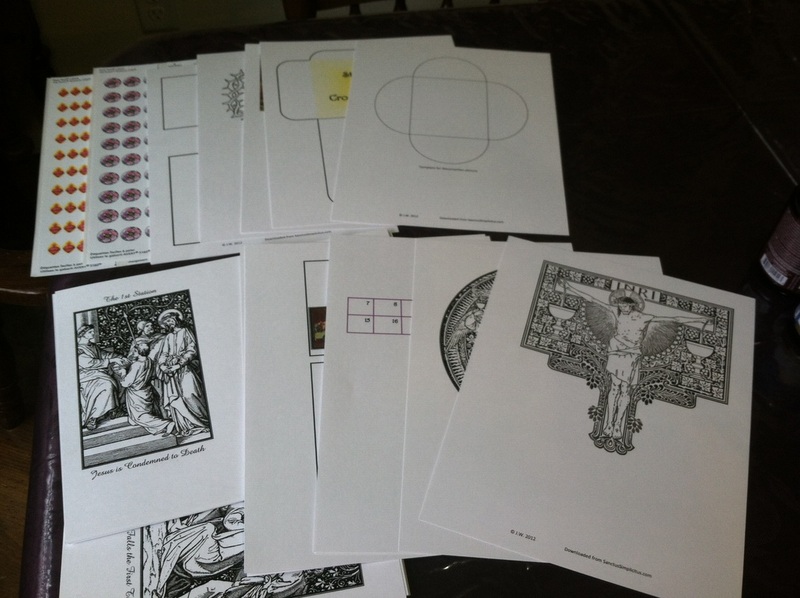 Print the Stations of the Cross. Cut to fit the pocket that was printed above, so that they are all similar in size making sure not to cut off any words or parts of the picture. We have one child that was able to do this fine and the other I drew lines around with a ruler and blue pen to give him some guides. If you wish, lovingly, reverently, while meditating on each picture, color the pictures of Our Lord's Way of the Cross. 8.) 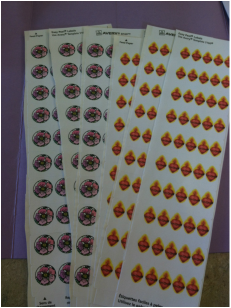 Print the Sacred Heart and Flower Stickers on the address labels. Make sure to check your printer settings (see above). Print single sided in color. Cut down each set of 5 (with the Avery labels there is a non sticker gutter there) and then cut down each row. Store in a plastic bag. 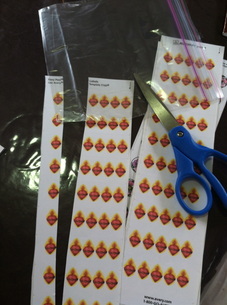 The Sacred Heart Stickers will be used to count down the days of Lent with on the count down cross. 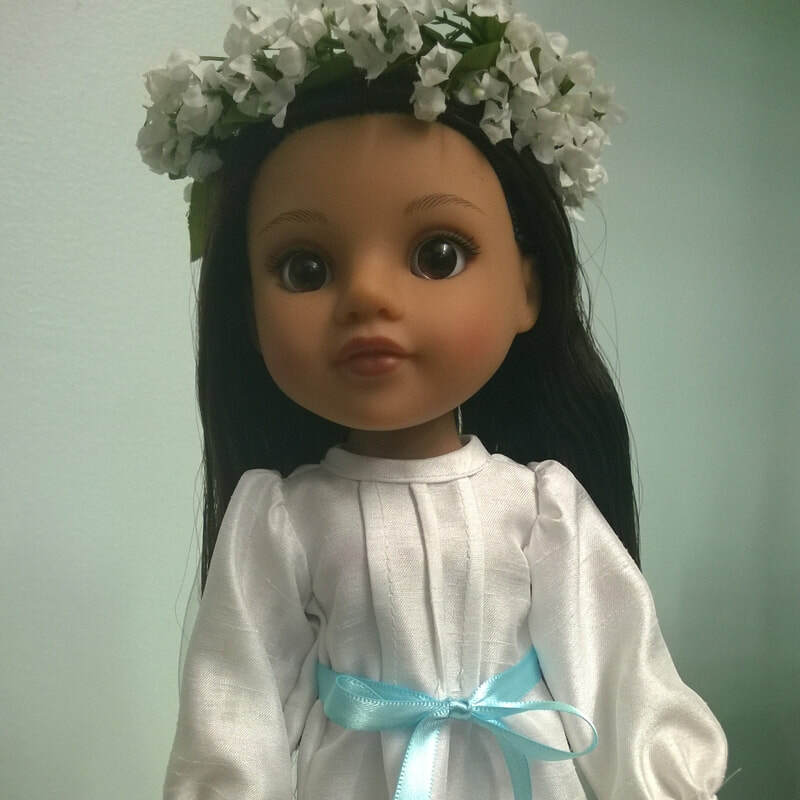 The flowers are placed on the Crown of Thorns for every good deed and sacrifice the child does so that by Easter they have turned the Crown of Thorns into a wreath of flowers for Jesus. Putting it All Together! Lets start with folding the folder! 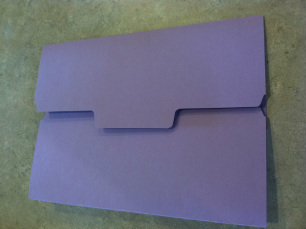 First open your file folder like a book…. Now fold the other side so that it lines up with the cut of the side you just folded. When you get it folded it will look like this, divided into 4 sections. Since that branding mark was showing inside our folder, I turned it over and creased the folds in the opposite direction. Time to start placing the pieces in their new home…. 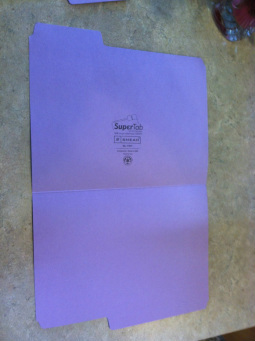 Glue HALF of your cover piece to the left side, of the front of your file folder. Glue the Crown of Thorns to the lower right of the cross. 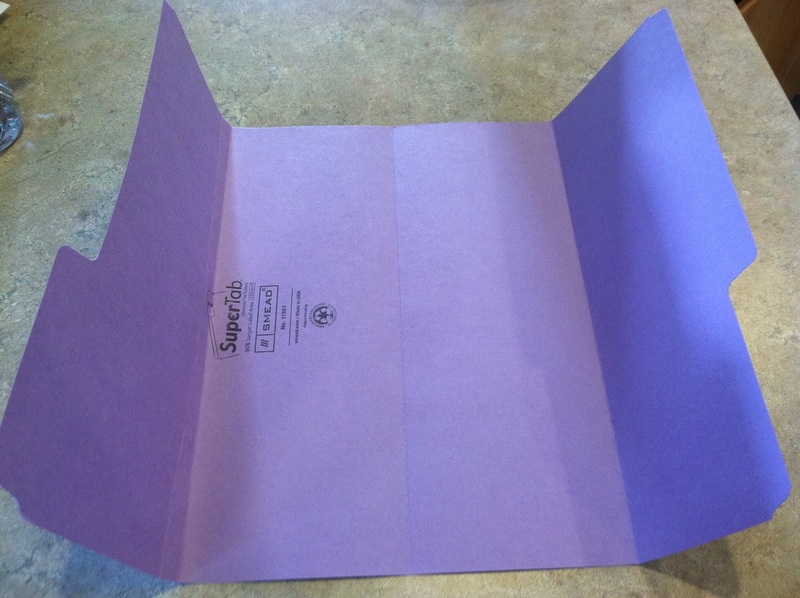 The middle of the Crown will have the crease of the folder behind it, that is ok, it will fold with the folder. 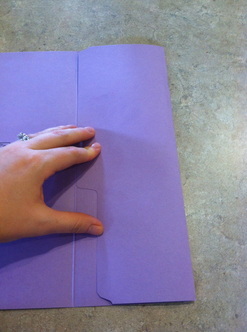 Open your folder like a book and glue your Lenten Cross Count Down in the center. Add the History of Lent Book to the left top side of the folder. Glue the All for Jesus book to the top right of the folder. 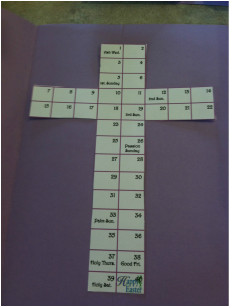 Fold your Holy Week Match Books: Fold the picture part at the line over the text. For the two small ones that will be the only step, just folding them in half. If the matchbook is longer, fold UP the bottom part under the picture part. Glue in your lapbook in order (Palm Sunday, Passion Sunday, Maunday Thursday, Black Friday and Holy Saturday) placing the glue on the back part which should be white allowing the book to still open. Glue the back of the Stations of the Cross pocket to the lower left hand corner. 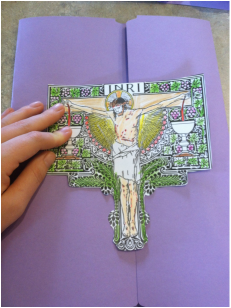 Glue the Prayer in Commemoration of Our Lord's Passion between the Crown of Thorns and All for Jesus book. To the back of the folder staple the bag at the top between the seal of the bag on only the BACK side of the seal. Then place your stickers inside and this will allow you to seal and re-seal the bag while keeping the stickers with the lapbook for the next 40 days. Punch a hole in the flap of the front cover and also in the side of the file folder just opposite. Tie a ribbon or string in a bow to secure the lapbook closed. 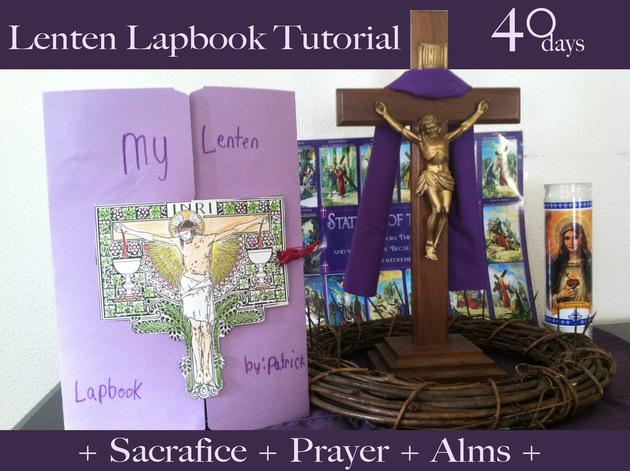 Write My Lenten Lapbook and place authors name on it. 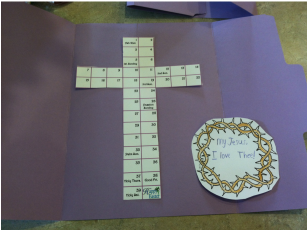 Enjoy using your lapbook through- out Lent to encourage sacrifices, to teach children to forget themselves and think of others and also to pray to Our Dear Lord. The sufferings of this life bear no proportion to the greatness of the glory to come. 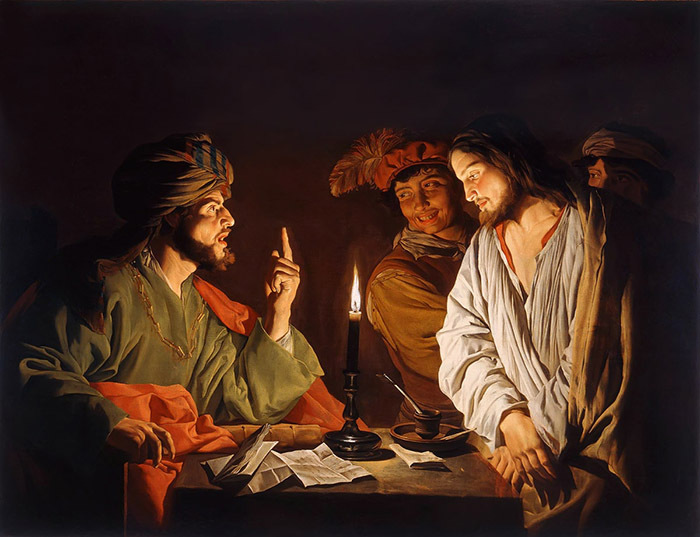 THE blind man of Jericho, whose healing is recounted in the Gospel of this day, is the image ... of a soul which has fallen into spiritual blindness. Consider well the characters and the remedies of this moral blindness, which is the saddest of all. First Point.—The characters of spiritual blindness. there be a state more fearful than this in the eyes of reason and in the eyes of faith ? The blind man of Jericho, to sustain his sad existence, asked of those who passed by an alms, which was often refused him. The Gospel says he was begging - mendicans. This is the second character of spiritual blindness. 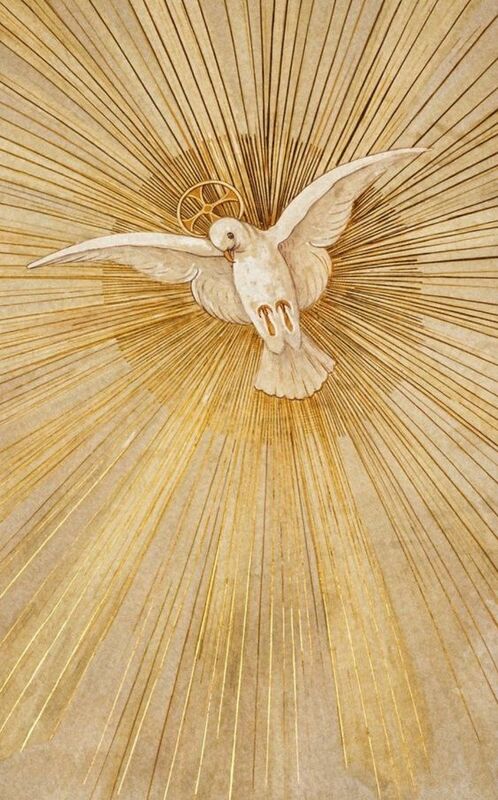 In the bosom of the Catholic Church, the depository of eternal truths, in the midst of that light with which Christianity has inundated the world, in the midst of so many means to find repose of mind and peace of heart, they who are stricken become mendicants. They ask of reason light which they have not; they ask of human wisdom the truth which she cannot give; they ask of pleasure joys of which she is ignorant. In their need of joys, their famished souls extend their hands to the passions and to pleasures. Each passion and each pleasure deposits an alms, but it is only an alms; it may suffice to solace, or rather to distract, the heart for a moment, but it is powerless to satisfy the need which devours it; it remains hungry and is always begging—mendicans. The blind man of Jericho was seated on the wayside. This is the last trait which characterizes those who are spiritually blind. They are near the way which conducts to truth, to virtue, to life, and still they do not wish to enter there. Reflect on this expression, which contains a truth at once profound and true—"He was sitting. " It is not said that he was standing and ready to walk, but he was seated; he remained there in stupid repose, unmindful of what was passing around him. This expression is sufficient to make us understand that he was satisfied in his unfortunate carelessness, preferring an unworthy repose to generous effort which would place him in the right way. This is only a too true picture of those sinners of whom we are speaking. They are outside the way which conducts to salvation, and are not striving to re-enter it. To do this they should be most active, and instructed in their duties, and resist their passions, or at least make some efforts; but they love their ease beyond anything else, and nothing can determine them to abandon their tranquillity. 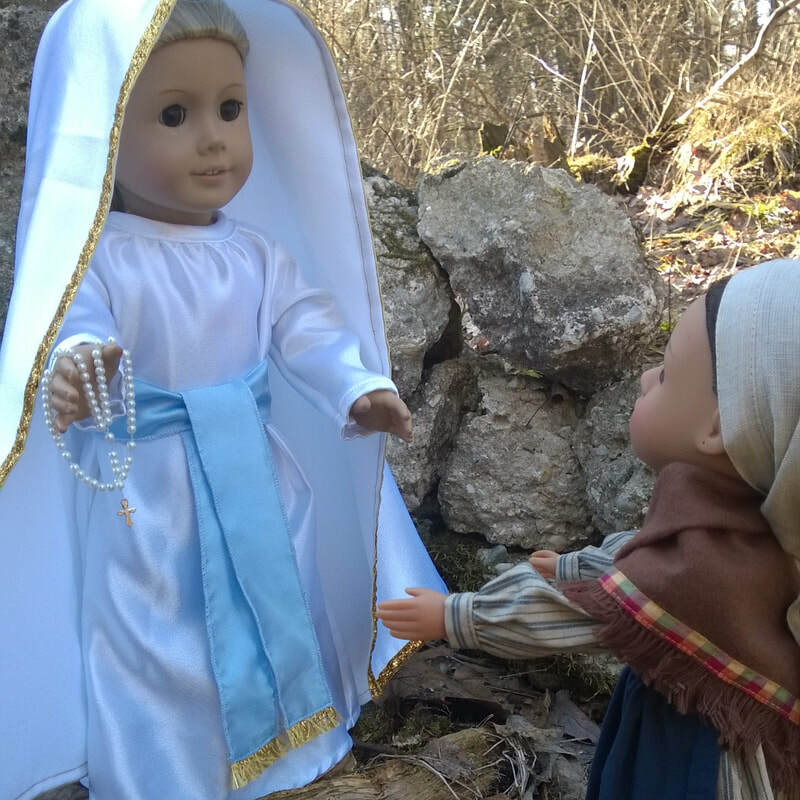 And thus the privation of all truth, the want of all good works, and complete carelessness of salvation are the characters of this terrible malady which is called spiritual blindness. We shall now see how it may be healed. Second Point.—For a complete cure of spiritual blindness, the first thing which must be done by him who is afflicted is to be instructed in his religion and to make known his uncertainties and doubts to those who can resolve them. At the sound of the voices which were about him and the noise made by the multitude which had followed Jesus, the blind man informed himself of air that passed. He asked "what it was." Well, Christianity passes near us, is about us on every side, with its laws, its dogmas, its blessings, its threats, and its promises. We should inform ourselves what it is, we should study the claims and proofs on which it rests, the duties it imposes, and labor earnestly to merit the blessings which it promises. We should avoid the evils with which it threatens us, since eternity is well worth the trouble which all this requires. Indifference in this matter is wholly unjustifiable. The second thing to do in a case of spiritual blindness is to pray. Faith is a gift of God, and this gift we all receive in Baptism. This explains the facility with which we believe the highest mysteries, even in tenderest infancy, and as long as we preserve purity of heart. But when, by bad books, sinful conversations, voluntary doubts, and by indulgence of our passions we have driven the spirit of faith from our intelligence, we cannot again recall it, except by most fervent prayer. But you say, "I wish I could have faith!" Have you prayed to obtain it? Reflect on the prayer of the blind man imploring his healing, and strive to imitate his fervor. "Have pity on me, Lord, Son of David!" See how he feels his malady, how he desires a return of health. And what perseverance in his prayer! They who are near to him endeavor to impose silence on him, but he seems unmindful of them and is not at all influenced by their words; he even cries louder still. From the moment you wish to belong to God the world will blame you. Prejudices, habits, passions shall strive to turn you away from prayer. However, still remain faithful to it, since your healing and your salvation will be due to your perseverance. O my God, I address Thee with the prayer which the poor blind man employed—" Son of David, have pity on me!" Have pity, because of the sad state to which sin has reduced me. Make known to me my misfortune in its fullest extent; I do not know it sufficiently. Place in my heart a lively and profound sorrow for my sins, which should be there and which I do not find there. Inspire me with those strong, courageous, and efficacious resolutions which I strive in vain to form. Break these criminal attachments and these vicious habits which I have not the strength to break. Reform my sad inclinations which drag me down in spite of my feeble efforts. Have pity on me, Lord ! Have pity on my weakness! Do not fear the Cross. . . . Without it you cannot find Christ. With it you will find the help and consolation of His open Heart. Without Christ the cross is hard, dead, crushing wood. With Christ the Cross is strong as God, sweet as love, tender as a tear.